I'm sure that it will look something like this. Need Ветхий дневник картографа to reach 700 skill. 3 Жезл заступника дренорских кланов. Requires: Killing Кераксас to trigger quest. Requires: Level 100 and 3 Followers with ilvl 675. According to Warcraft Pets, this is a rare P/P (1237-8/341/276) pet. Have a good luck! * If Wowhead updates that page and I don't notice it, feel free to report this comment, but please understand why it was posted. Thanks! Obtained from the rare Ilvl 675 garrison mission "Fiery Friends", which has a chance to show up once a week. It is a 3-follower missions with 6 counters. It costs 100 garrison resources to complete and it has a default duration of 12 hours. It is bind on equip so you can buy it/sell it on the auction house. They're around 900 gold on my server at the time of this post. The model on this page represents the skin of this battle pet, but its the wrong color. Going to submit a screen of the in game look. 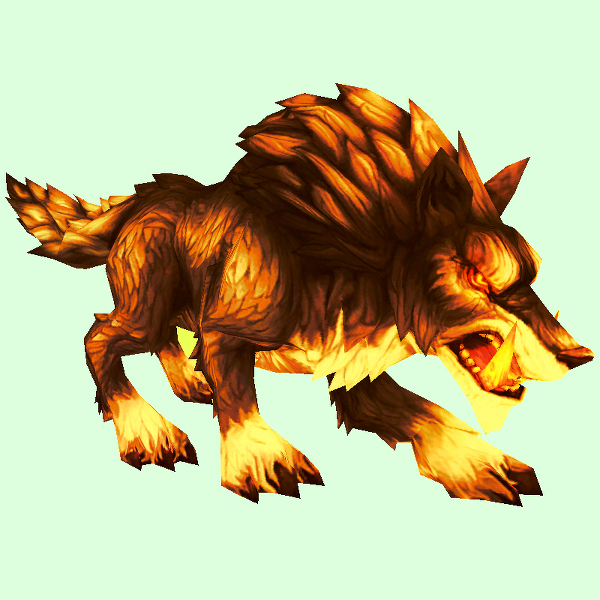 For developers looking for this pet's species id it's 1662. Вы нашли этого щенка, когда он грыз обгоревшую кость в Черной кузне литейной клана Черной Горы. Вы взяли его с собой, и с тех пор он очень к вам привязался.